The house at 85-15 Wareham Place, where Donald Trump lived as a boy, will be auctioned off on Jan. 17. 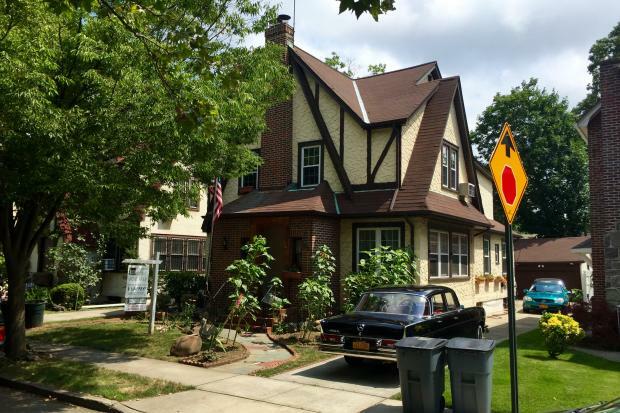 QUEENS — A mystery buyer has purchased President-elect Donald Trump’s boyhood home in Queens last Friday and is planning to sell it at an auction in January, in hopes of turning a profit, auctioneers said. But Misha Haghani, owner of Paramount Realty USA, which is handling the auction, declined to reveal name of the buyer who snatched up the five-bedroom, Tudor-style home where Trump was born and lived until he was 4 years old. The value of the home had been expected to have increased dramatically since Trump won the 2016 presidential election on Nov. 8, real estate experts said. However, the initial asking price for the house has been reduced twice since it was listed on the market in July — first to $1,399,000, and later to $1,250,000, according to the property's listing broker Laffey Real Estate. But Haghani said there is a lot of interest in the property which is scheduled to go to auction on Jan. 17, only 3 days before Trump will be sworn into office. Trump himself joked on "The Tonight Show Starring Jimmy Fallon" earlier this year that he was interested in the property. "I wanna buy it, it's beautiful," he said. The previous property owners, who are restaurateurs in Manhattan, bought the house in 2008 for $782,500, sold the house because they are getting divorced, Haghani said. The 2,500-square foot brick and stucco house was scheduled to go to auction in October but those owners decided to postpone it until after the election. Haghani said it’s hard to estimate the current value of the property and the auction will determine it. “This unique property which is like art because it has value that goes beyond just real estate is finally going to be sold in an auction context which is the right context for selling unique property like this,” he said. "There are only 45 childhood homes of U.S. presidents," he added. The home’s broker, Howard Kaminowitz of Laffey Real Estate, did not immediately return a phone call seeking comment. The auction will take place on Jan. 17 at 4 p.m. For more information go here.